Proof that good service doesn’t always cost more. Because planning a weeks worth of healthy and delicious dinners is hard work and remembering to buy all the ingredients almost impossible, the weekly food shop is as tedious as it is difficult. Joining You Plate It gives you the unique opportunity to have a team of people who are passionate about their food do all the work for you. 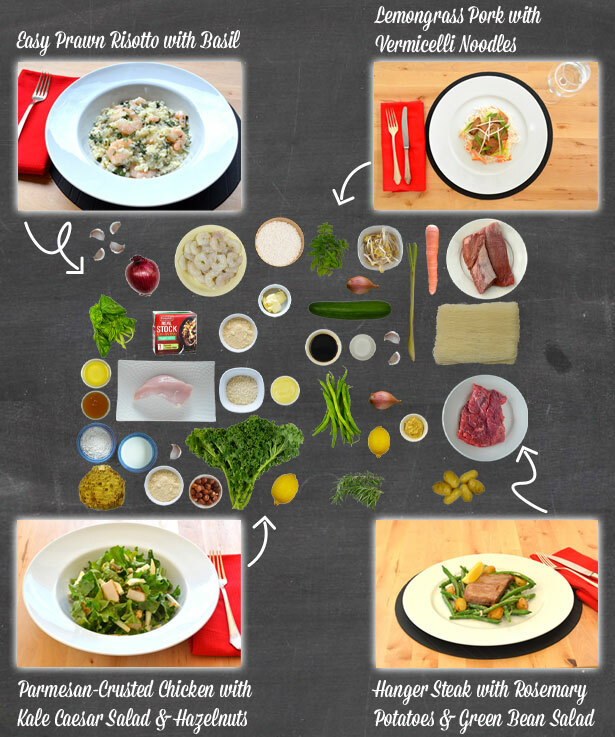 Each week, we create 6 new and exciting recipes, you then choose the 4 or 2 (depending on your subscription) you want. Each recipe is a balanced meal between 500-700 calories per plate. 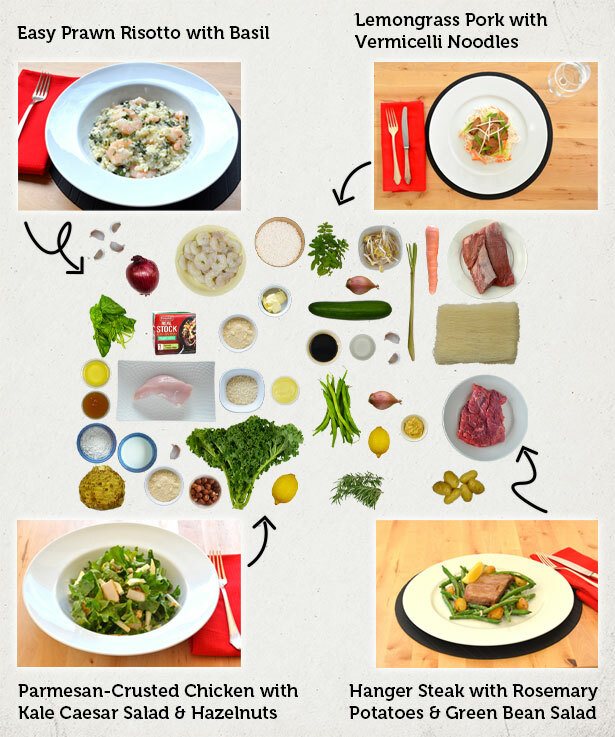 We pre-portion the ingredients and provide almost everything you need, which means there is less food waste and you can plate a delicious dinner in around 35 minutes. 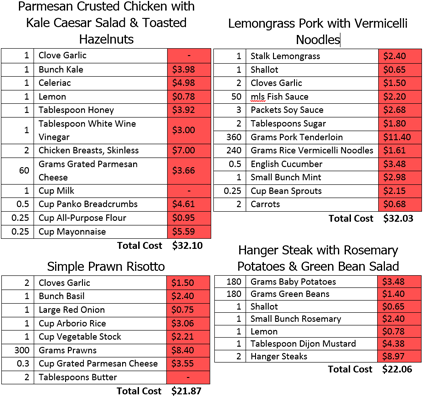 Having your weeks menu planned and the shopping done is convenient, but we wanted to show it’s also affordable. I finally put my legal and economics degrees to good use and crunched the numbers. I estimate you save 20% when compared to the supermarkets. At $99 delivered, You Plate It would save you 20%! I’m a big fan of short stories, and one of my favourite authors is Ernest Hemingway. 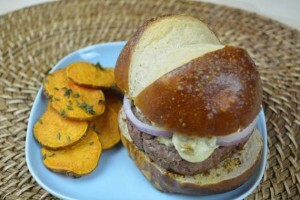 Not long ago I found a link to another piece of Hemingway writing – his favorite burger recipe. So Paul and I did the only thing that made sense – we cooked it and washed it down with beer. This turned out to be easier said than done and the task of collecting the spice mix involved research, substitution and a couple of trips to the shops. I read that Hemingway enjoyed the burger with a simple topping of grated cheese. I’m not a fan of plain burgers, and so we topped ours with a hop+cheese sauce and red onion. My verdict: The burger is packed full of flavors and very salt heavy – perfect with beer. I think the shear number of ingredients overwhelmed the beef flavor. Overall it was super tasty, but I prefer a less complicated beef patty and unless I was cooking for a Cuba themed bbq, this particular recipe won’t be my go to burger. An exotic blend of spices, Ras el hanout is Moroccan and in the same school as a complex Indian curry or Mexican mole. It’s name in Arabic translates to “head of the shop” and suggests the blend was a combination of the best spices a shop keeper had to offer. There is no single recipe and different families, restaurants or shops will have slightly different blends. Nevertheless, common ingredients include turmeric, cumin, ginger and cinnamon – some variations have more than 20 different spices! We’ve used this delicious spice in our Beef Tagine. Staying with the North Africa theme, Tagine is a type of stew named after the earthenware pot in which it was traditionally cooked. Traditionally a vegetarian dish it is typically made with hearty root vegetables. Our recipe includes beef and is perfect for a cold winter night! It may be winter outside, but that shouldn’t stop us dreaming of a summer holiday. What better way to escape the reality of a cold winter in Perth than with a tropical cocktail. “Escape (If You Like Piña Coladas)” by Rupert Holmes tells the tale of two lovers meeting in a bar and discussing the concoction of rum, coconut milk and pineapple juice. Like the song, the drink is a guilty pleasure for many. It’s a sweet, rum-based cocktail made with rum, cream of coconut, and pineapple juice, usually served either blended or shaken with ice. Popular cocktails invariably have an interesting tale about their creation – the Pina Colada is rumoured to have been invented by a pirate, Roberto Cofresí. We’re not sure on the validity of that, but we’re reliably informed by Wikipedia that the earliest printed reference is in a Travel Magazine from December 1922. Shake ingredients together on ice and serve immediately. Garnish with mini umbrella and some pineapple. The Negroni – Mark’s favorite drink. From dive bar to home bar, the Negroni is a classic that will never fail. When it’s time for Friday cocktail hour, one of our favourites is the Negroni. The story goes it was invented in 1919 by a Florentine aristocrat, Count Camillo Negroni who wanted something stronger than his Americano. We don’t know how true that is, but we do know it’s a great drink to unwind with on a Friday arvo. To make: mix equal parts gin, sweet vermouth and campari and serve over ice with a twist of orange peel. Mixing a good Negroni is foolproof. It’s made of equal parts so all you need to do is add the ingredients into a rocks glass with ice and give it a few stirs. See? Easy. Add an orange twist if you want to increase the level of fancy. Ready for your Sunday morning breakfast? Here are the 4 simple steps to making a poached egg. Step 1 – Heat water: Bring a pot of water to the boil. Add a tablespoon of white vinegar. Reduce heat to a gentle simmer. Step 2 – Break the egg: Crack the egg into a small dish. Step 3 – Cook: Gently slide the egg into the hot water and cook for 2 minutes. Step 4 – Remove and Dry: Remove egg from water with slotted spoon. Place on a paper towel. June 17 is “Eat Your Vegetables Day” and the perfect excuse to try and get that extra serve of vegetables into your diet. In Australia, the recommendation is to eat 2 serves of fruit and 5 serves of vegetables a day. The natural question is then: how big is a serve? The physical size of the serve will vary depending on the specific fruit or vegetable. This is because the guide for what constitutes a serve is based on weight. A standard serve of vegetables is 75 grams. For fruit, it’s 150 grams. My mum (bless her) was always telling me to eat my vegetables because they are good for me. Thankfully, we don’t have to rely solely the testimony of my mum. A study, by University College London, found that eating large quantities of fruit and vegetables significantly lowered the risk of premature death – my mum was right all along. Knowing that eating vegetable and fruit is good for you is not groundbreaking, what is amazing is the size of the effect it has. The study found that eating at least seven serves of fruit and vegetables a day reduced the specific risks of death by cancer and heart disease by 25% and 31% respectively. This UK study therefore supports the Australian recommendation of “Go for 2&5”. Unfortunately, there is no shortcut to gaining the health benefits. Your fruit and vegetables need to be fresh (or preferably combined as part of one of our delicious recipes). The same study found no evidence of significant benefit from fruit juice. Amazingly, canned and frozen fruit appeared to actually increase risks associated with cancer and heart disease by 17% per portion. The sheer scale of the health benefits means it’s time to put down that tinned food, put away your frozen dinner, cancel your takeaway order and instead start to cook delicious recipes with fresh local ingredients – that’s why we exist.